A Kentucky state senator whose professional background includes media and event management positions within the Thoroughbred industry has filed a bill that would redistribute how a portion of the state’s excise tax on horse racing wagers gets used to fund equine education programs at Kentucky’s colleges. 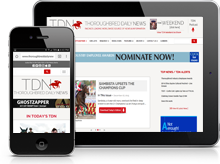 Damon Thayer, the Republican Majority Floor Leader, told TDN via phone Monday that the prime objective of SB81 is to revise a state statute so that two horse industry-related programs that didn’t previously exist when the law was originally written can benefit from the funding, which currently amounts to two-tenths of one percent (0.2%) of the state’s pari-mutuel handle. Specifically, the two programs Thayer is aiming to include are the University of Kentucky’s Ag Equine Programs (which encompass all equine activities within UK’s College of Agriculture, Food and Environment), and Bluegrass Community and Technical College’s North American Racing Academy, which was originally a jockey training school founded by Chris McCarron, but has evolved into a wider program that educates potential exercise riders, assistant trainers, breeding farm managers and other workers skilled in the care and training of the racehorse. Thayer said that right now, the way the existing statute is written, only the University of Louisville’s Equine Industry Program receives funding from the excise tax on horse bets. Thayer said another factor in changing the statute has to do with additional excise tax money that is now being generated by historical horse race (HHR) wagering, which creates a larger fiscal pie for the three educational entities to share. “A wager on HHR is treated and taxed the same way as a wager on live racing, so there’s more money going into the fund,” Thayer said. Thayer said he wants all stakeholders to understand that even though he has introduced his legislation during the 2019 session, he is not intending to actually try to get it passed until 2020. The current draft version of the bill contains 2019 language only as a placeholder, he explained, because he wants the topic to be discussed and possibly improved before pushing for its passage in 2020. Thayer said the excise tax on Kentucky’s horse bets gets divided to fund a number of other entities besides education. Some of the money goes into he state’s general fund, a portion goes to the Kentucky Thoroughbred Development Fund, and some of it funds the Equine Drug Research Council that makes recommendations that help the state racing commission establish medication policies. Dating back over three decades, Thayer’s racing-related jobs have included stints with the Breeders’ Cup, the National Thoroughbred Racing Association, and as the director of communications at Turfway Park.